Home Actresses We Caught Kajol Getting Herself Pampered – Photos! 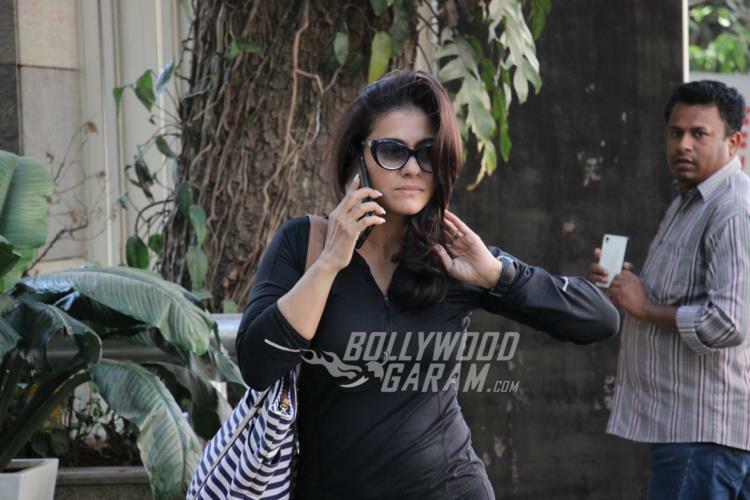 We Caught Kajol Getting Herself Pampered – Photos! Indian actress Kajol was snapped as she came out of a salon in Mumbai on March 14, 2017. Mrs. Devgn has just completed filming for her second Tamil movie, ‘Velaiilla Pattadhari 2’ (VIP 2) opposite Dhanush and is currently in Mumbai. Kajol looked stylish in a casual black top and yoga pants. She chose to complete her look with a striped beach bag and glares. The actress attended designer Manish Malhotra’s Mijwan Summer 2017 Fashion Show after which she left for Chennai to complete shooting for ‘VIP 2’. On the work front, she was last seen in ‘Dilwale’ (2016) opposite Shahrukh Khan and was seen actively participating in the promotions of Ajay Devgn’s ‘Shivaay’. Reports say that the actress will soon be seen playing the role of a single mother in an upcoming movie directed by Anand Gandhi and produced by Ajay Dvgn. The actress was also recently in news for her public fallout with filmmaker and old friend Karan Johar. There was a time when Kajol and Karan were inseparable as friends and Karan used to consider her as his lucky mascot. Certain misunderstandings arose between the two after the release of Ajay’s ‘Shivaay’. Wishing her the very best for the success of her Tamil movie, VIP 2.